In the days after President Trump fired James B. Comey as F.B.I. director, law enforcement officials became so concerned by [Trump's] the president’s behavior that they began investigating whether he had been working on behalf of Russia against American interests, according to former law enforcement officials and others familiar with the investigation. The inquiry carried explosive implications. Counterintelligence investigators had to consider whether [Trump's] the president’s own actions constituted a possible threat to national security. Agents also sought to determine whether Mr. Trump was knowingly working for Russia or had unwittingly fallen under Moscow’s influence. Agents and senior F.B.I. officials had grown suspicious of Mr. Trump’s ties to Russia during the 2016 campaign but held off on opening an investigation into him, the people said, in part because they were uncertain how to proceed with an inquiry of such sensitivity and magnitude. But [Trump's] the president’s activities before and after Mr. Comey’s firing in May 2017, particularly two instances in which Mr. Trump tied the Comey dismissal to the Russia investigation, helped prompt the counterintelligence aspect of the inquiry, the people said. 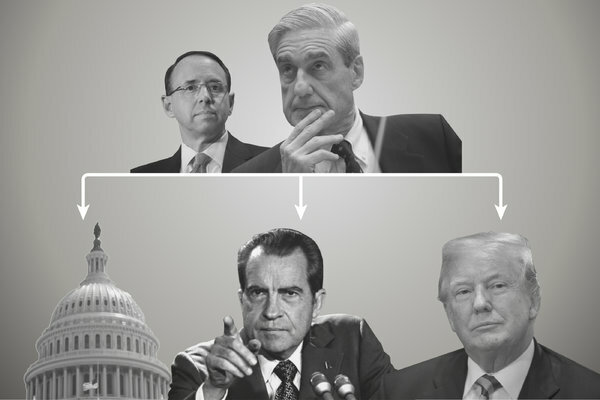 The special counsel, Robert S. Mueller III, took over the inquiry into Mr. Trump when he was appointed, days after F.B.I. officials opened it. That inquiry is part of Mr. Mueller’s broader examination of how Russian operatives interfered in the 2016 election and whether any Trump associates conspired with them. It is unclear whether Mr. Mueller is still pursuing the counterintelligence matter, . . . . If [Trump] the president had fired Mr. Comey to stop the Russia investigation, the action would have been a national security issue because it naturally would have hurt the bureau’s effort to learn how Moscow interfered in the 2016 election and whether any Americans were involved, according to James A. Baker, who served as F.B.I. general counsel until late 2017. The F.B.I. conducts two types of inquiries, criminal and counterintelligence investigations. Unlike criminal investigations, which are typically aimed at solving a crime and can result in arrests and convictions, counterintelligence inquiries are generally fact-finding missions to understand what a foreign power is doing and to stop any anti-American activity, like thefts of United States government secrets or covert efforts to influence policy. . . .
Trump had caught the attention of F.B.I. counterintelligence agents when he called on Russia during a campaign news conference in July 2016 to hack into the emails of his opponent, Hillary Clinton. Mr. Trump had refused to criticize Russia on the campaign trail, praising President Vladimir V. Putin. And investigators had watched with alarm as the Republican Party softened its convention platform on the Ukraine crisis in a way that seemed to benefit Russia. Many involved in the case viewed Russia as the chief threat to American democratic values. “With respect to Western ideals and who it is and what it is we stand for as Americans, Russia poses the most dangerous threat to that way of life,” Ms. Page told investigators for a joint House Judiciary and Oversight Committee investigation into Moscow’s election interference. Someone innocent does not behavior the way Trump acted and continues to act. Moreover, he continues to further Putin's strategic objectives. Treason is perhaps the best description. And yes, I delete all references to Trump as "president" because it degrades the office to use the term in in conjunction with Trump's name. Glad you don’t call him President. Neither do I. And bet he’s furious they were investigating him. Like it’s a surprise.